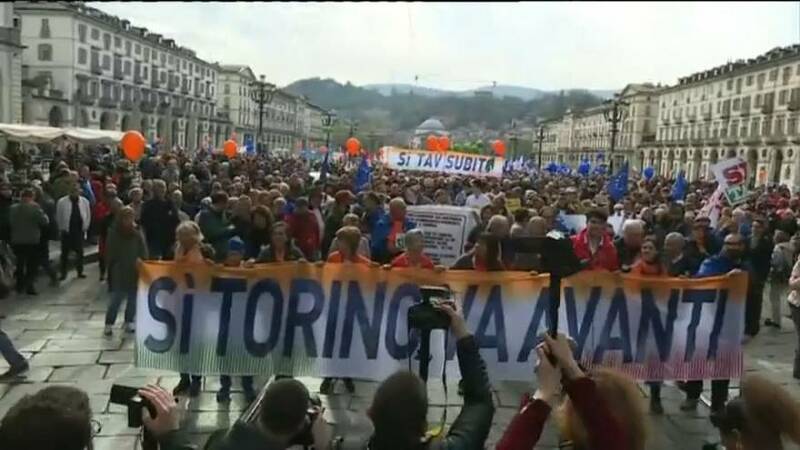 Hundreds of people marched in Turin on Saturday in favour of the controversial high-speed-train between France and Italy. It's the fourth time the rally has happened. Its aim: to say 'YES' to the proposed trans-Alpine train line between Turin and Lyon. It'll be one of six tunnels crossing the Alps and replaces one built in 1871. The journey time between Paris and Milan will be cut from 7 hours down to 4.5 hours. France has already built three access tunnels, but Italy has only built one. The Italian coalition government is divided over the plans. The League is in favour of the venture but the Five-Star Movement is tied to the NO-campaign. Italy could lose €813 million of EU funding if it doesn't start the next phase by the end of 2019 and if it doesn't go ahead, then both the EU and France could seek damages from Italy if the project is entirely blocked, according to the former Government extraordinary commissioner, Paolo Foietta.